Understanding match types is essential to both SEO in general and more specifically keyword research. I’ve received various questions about the significance of match types and I’ve seen some rather confusing and conflicting information on this topic, while searching through forums and blogs. In this post, you’ll find a simple, straight-forward explanation of what the three match types are all about and exactly how this is significant to you. 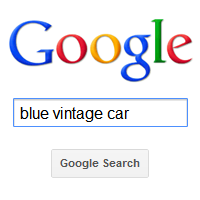 I will be using “blue vintage car” as a randomly picked example search term. Please feel free to follow along with some Google searches of your own, with any kind of keyword. To illustrate the difference in match types, I recommend you use a search term with at least three words. With this kind of search, we are asking Google to return pages that contain the words contained in the search phrase, as well as synonyms for those words in any order and any distribution. In general, a page containing the exact words you searched for, in the correct order, is likely to show up further up in the results than one with synonyms and a different order of words. The further down you go in the search results, the more “exotic” the listed results will become. As you can see, “vintage” is not featured as a word on the page, but the synonym “old” does. In addition, the three words are quite far apart on the page and aren’t even in the same sentence. The point of this is simply to illustrate: with a broad search, Google will return absolutely any page with even a hint of similarity to your search term. You’ll see that the number of results found is now significantly lower. This is because for a phrase match search, Google will only return pages that contain the keyword exactly as you typed it in. In this case, the three words “blue vintage car“, in exactly that order. Also, synonyms are no longer used, when you do a phrase match search. If you are using Google as a search engine, there is no such thing as exact match and this is perhaps where some of the confusion about match types stems from. Exact match only exists as a search type from the perspective of keyword research (either for SEO or for PPC advertising). If you access the Google AdWords Keyword Tool, you can activate the three different match types in a small box in the left sidebar (see image). Now, whenever you get keyword suggestions, you’ll always get three versions: the plain broad match keyword, the “phrase match keyword” in quotes and the [exact match keyword] in square brackets. The significant difference between the three match types comes into play when we look at the search volume numbers. As you can see, it’s estimated that our example keyword gets over 12,000 broad match searches per month, but only a dozen exact searches. What does this mean? The search volume of a keyword is one of the important factors to take into account, when doing keyword research. In order to answer the question “how many people are searching for this keyword”, you have to always look at the exact match search numbers. Only the exact match numbers are an estimate of how many people are searching for that specific keyword. An SEO campaign should always focus on one keyword at a time, since trying to get a top position for a dozen keywords all at once, for one and the same page is a surefire way of spreading yourself too thin and not getting any results at all. And when you are focusing on and optimizing for one keyword, all of the possible variations of that keyword that show up as broad match searches really have no relevance. In other words: when you’re working to get the top spot for “blue vintage car”, it doesn’t matter how many people search for “classic blue car photo album”, “vintage blue jeans jacket with car emblem” and countless other broad-match variations, because you aren’t going to rank for those phrases. Everything you need to know about broad match, phrase match and exact match, for keyword research and SEO. If you have any questions, please don’t hesitate to leave a comment below! I am a beginner with keyword research and beginning to ‘get it’. No instant keyword master, but from this point forward, there is no going back. I appreciate your clear teaching by example with text and video for reinforcement. Thanks for the “Ah-ha!” moment. Hey, no one’s an instant master at anything. The problem with this whole make-money-online thing is that you’re constantly bombarded with these claims that you can make thousands of dollars in no time at all. The reality is that even the uber-gurus mostly had no success in their first few months or even years doing this. Internet marketing has a learning curve, just like everything else. And just like everything else, if you stick with it and stay focused, you’ll eventually make it. Love the article. This is one of the toughest items for me to grasp and implement into everday keyword selection for my webpages. I give websites away completely free with no attached sales proposal and make no money doing so and I deal with people that have absolutely no knowledge of the importance of keyword research or how to perform it. I do want to thank you for providing valuable information and taking time out of your schedule to assemble this info for all of us to use. I am putting this site on my website as an Rss feed because it will provide tremendous help for beginners that visit my site. Thank you for the kind comment! I’m very happy that you found this article so useful. Anyways, I am using Market Samurai for my KW research, and they can only pull and show competing pages for PHRASE match. They recommend anything under 30k competing phrase match Google page results as a good indicator of something worth the effort to optimiaze and rank for. What is your thoughts on this <30k benchmark?? While Market Samurai is an excellent tool, in my opinion, the 30K (or any other number) search results benchmark is meaningless. It’s simple, which is why it caught on (you can find this advice in many resources), but the number of results listed has very little to do with the competitiveness of a keyword. A benchmark like that assumes that the ratio of optimized vs. un-optimized pages will always be the same, no matter what keyword you’re looking at, and that’s simply not the case. For example, if you look at a keyword closely related to a popular ClickBank product or just generally a popular, high-priced product with an affiliate option, you can bet that there will be many, many pages of highly optimized content. People are scrambling to get their sites to page one for hot CB products and there may be relatively few sites listed in the results that are not specifically optimized for that keyword. For other keywords, you sometimes have to go no further than page two to find sites that you can easily beat with some solid on-page SEO and a couple of backlinks. The number of results listed in these two scenarios may or may not be similar. Finally, the keyword you go for should be determined by the SEO strenght of the pages listed in the top few results. If you have enough experience, skills, tools and time to beat those sites, go for it. Example: If you know your on-page SEO and you know you can comfortably build 100 good backlinks in a reasonable amount of time, go for any keyword with non-super-optimized pages that have <100 backlinks listed on page one in the results. Of course people search with quotes. But nobody searches with brackets. Especially about the part on beating the page 1 competition FOR BROAD MATCH. Thanks for your comment! I’m glad you found this post helpful. I’m glad you reposted/resurrected/updated this post as it seems to cause endless confusion and misinformation with a lot of people. I’m constantly having to explain to various people what the differences are and why it’s important. I’ve lost count of the number of people who build a micro-niche site around a keyword that was based on broad match search results and then they wonder why they are getting a tiny trickle of traffic when they rank at #1. One thing you didn’t mention with Phrase match results is that it can include punctuation. I’ve had the same experience. It’s one of those tricky subjects, where if you search for it online, you’re as likely to come across information that’s completely wrong, as you are to find something useful. Regarding the punctuation: that’s a good point and I’d not even considered that before. The best explanation i have read to date and should make things easier moving forward.. Well done! I’ve never come across the suggestion that the GKWT uses synonyms in broad match before, are you sure? I can understand them using it in search to try to give the user what might be appropriate, but in KW research, especially for PPC I wouldn’t have thought that they would do that. If so it’s yet another reason to pay little attention to broad match. Personally, I like to compare all forms, as a large search volume in exact might not go up very much in phrase or even in broad, meaning it’s not worth targeting. Whereas some lower volume exact searches expand a lot in phrase, giving you the chance to rank for many versions. Keyword variations can include synonyms, singular/plural forms, relevant variants of your keywords, and phrases containing your keywords. If AdWords ads are shown for synonym searches and the search volume is supposed to reflect the potential reach of an ad, I assume synonym searches are included in that number. I agree 100% with the importance of the psychology factor, next to just looking at the raw numbers. It’s probably also worth mentioning the new match type that Google have introduced recently that comes into play on for Adwords advertisers. It’s called broad match modifier and is essentially middle ground between broad match and phrase match. Congratullations for your post, very enlightening, as usual. I’ve been trying to cope with the keyword research theme. There is no doubt that this is the most essential topic to a future good venture. The rest is dependent of the keywords that are going to sustain the sites. But the search volume is the issue that still makes me doubt. Essentially what I need to understand better is the search volume dimension, but applied to non English keywords, or sites for that matter. In my language, Portuguese, we have yet another problem wich is the differences between Portuguese and Brazilian writing. Perhaps the English writers have the same problem with English and American writing. Ok, so when I make a search for a given keyword typically I only find good search volume for one word keyword and on broad search. If I try the exact search then it’s basically impossible to find a acceptable keyword. The global search volume in Portuguese it’s much smaller the in English, that’s why I ask for your advice on what to do in those smaller search universes. Are we to use the broad instead? The reality is that local search volumes for individual keywords are often quite low. Ignoring that and looking at broad match instead won’t change it. However, the flip-side is that it’s usually a lot easier to rank for a local term. Great approach, I can’t agree more, well explained. With this article business owners will not be fooled with the SEO Companies by showing theme the ” Board Search Volume”, just a trick to get the business lol. Do you know the trick to find the exact competing pages? but there is another one for sure I just can’t remember it. allintitle and allinurl searches aren’t really any better than just searching in quotes. You’re still measuring some facet of how many pages are in Google’s index, which has no real correlation to how strong the top ranked pages are. In particular, explaining in detail the distinctions between the match types as they relate to search engines and keyword research. I get the question about ‘Exact Match’ types all of the time. This seems to be the most confusing of the three for most of the people that I talk too. Thank you for this of your post. I am new to Google keyword analysis, and my question is, our website aims to selling products online, and in the process of keyword research, which indicator should be paid more attention to, broad match, or phrase match? If phrase A has a big volume in broad search, but the volume for phrase search is quite low, and phrase B has a smaller volume in broad search, but the phrase search is bigger than phrase A, in this case, I should adopt phrase B, not phrase A, is this correct? Thank you very much for your help. Have a good day! If you are doing keyword research for SEO purposes, then neither the broad match nor the phrase match number are meaningful. Neither of them represent anything to do with SEO. The exact match number gives you an estimate of how many people actually search for an exact keyword, that you could try and get ranked for. If you’re doing keyword research for PPC campaigns, that’s a whole different story and not something I can go into (mainly because I don’t know enough about it). Great video and excellent illustrations! I do appreciate it when things are dumbed down for me and I thought you gave a very clear explanation of how this works and the slide were magnifiq!!! Looking forward to looking over more info from you! oh BTW, you’ve now been bookmarked by me. ;) Cheers! Thanks for the post. Great job! It’s really has a point. Here’s one tiny question about the “broad match” as far as i understand broad match includes “all words” in a keyword or synonyms instead in any order? Is there any chance that results may include less words that actually your keyword consist of, for example for “blue vintage car” the result can be smth like – “navy classic jacket” and that’s all? So “car” or “automobile” are absent? I guess that the answer is “no”. Because there’s no sense in volume of such results at all. I guess, but would be very appreciate if you draw some words about that. Thank in advance. Cheers! As you correctly guessed, broad match only includes searches that contain all of the words or synonyms and variations of those same words. If some of the words are absent, the search doesn’t “count” for that keyword’s search volume estimate. Great post! Cleared up a huge cloud of confusion for me, thanks! I am still a little confused about something… So say i target a keyword that has a broad search volume of 2000 monthly, but the exact search volume is only 150 monthly. Should I not try to optimize for this keyword? Would I get very little traffic? How would I tap into the 2000 broad searches? please help! Excellent post Shane. Really helpful read. Thanks for sharing.